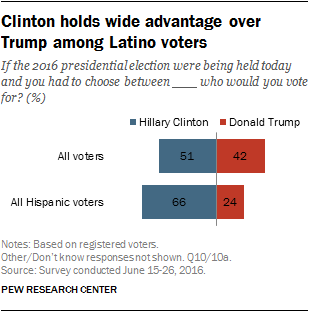 Hillary Clinton currently has a 66%-24% advantage over Donald Trump among Hispanic registered voters. In a three-way test, including Libertarian Party nominee Gary Johnson, 58% of Latino voters support Clinton, 20% support Trump and 13% back Johnson. At a somewhat later point in the campaign four years ago, Barack Obama’s lead over Mitt Romney among Hispanics was comparable to Clinton’s lead over Trump today (69%-21%). And in the summer of 2008, Obama led John McCain 66%-23% among Hispanic voters. According to national exit polls conducted after the 2012 election, Obama garnered 71% of the Hispanic vote (27% voted for Romney). Obama’s national vote share among Latinos was the highest for a Democratic candidate since 1996, according to an analysis of the exit polls by Pew Research Center. Clinton’s lead among Latino voters extends across many demographic subgroups. Among millennials (18 to 35 year olds) – who make up 44% of all Hispanic eligible voters – Clinton leads 71%-19%. Her advantage is roughly as large (65%-26%) among older Hispanics (those 36 and older). Clinton’s lead is somewhat larger among Hispanic women than it is among Hispanic men. Among Hispanic women, 71% say they support Clinton while 19% say they support Trump. By contrast, among Hispanic men, 61% support Clinton and 30% support Trump. In the past, Latinos have been consistently underrepresented in the electorate, compared with their share of eligible voters or the overall population. In the current survey, only about half of all Latinos (49%) say they are “absolutely certain” they are registered to vote. That compares with 69% of blacks and 80% of whites. There are several reasons why the share of Latinos who are registered to vote is lower than it is among blacks or whites. Many Latino immigrants may be in the U.S. legally but have not yet obtained U.S. citizenship. Many others are in the country as undocumented immigrants. Both groups are not eligible to vote, yet they make up about 30% of all Latino adults. The top voting issues for Hispanic voters are similar to those among all registered voters. An overwhelming share of Hispanic voters (86%) say the economy will be very important to their vote; among all voters, 84% cite the economy as very important. Terrorism is cited by 80% of Hispanic voters and an identical share of all registered voters. However, there are some notable differences in the priorities of Hispanic voters. Roughly two-thirds of Hispanic voters (68%) consider the environment a very important issue. Only about half of all voters (52%) view the environment as very important. Nearly eight-in-ten (78%) Hispanic voters say education will be very important to their vote for president. That compares with 66% of all registered voters. Hispanics also are more likely than all voters to rate the treatment of gay, lesbian and transgender adults (50% vs. 40%), immigration (79% vs. 70%) and health care (82% vs. 74%) as very important. Pew Research Center’s National Survey of Latinos has found that while immigration is widely viewed as an important priority among Hispanics, the economy, education and health care often are seen as important or more important. When asked which candidate is better on specific issues, for Hispanic voters, Clinton is seen as better than Trump on all 12 issues tested in the survey. Fully 81% of Hispanic voters say Clinton could do better in dealing with race relations, compared with just 14% who prefer Trump. Clinton also holds a 54-percentage-point lead over Trump on health care and a 48-point advantage on immigration. Clinton’s advantages among Hispanic voters are narrower on the three issues on which she trails Trump among all voters: Reducing the influence of special interest groups, improving economic conditions and defending the country from terrorist attacks. The size of the Hispanic electorate is expected to number 27.3 million eligible voters (adult U.S. citizens) in 2016, projected to make up 12% of all eligible voters, a share equal to that of blacks among eligible voters. But voter turnout among Hispanics has long lagged that of other groups. At this point in the campaign, Hispanic voters lag all registered voters on several measures of engagement. Two-third of Hispanic voters (67%) say they have been following news about the election very or fairly closely. That compares with 85% of all voters. And while 80% of all voters say they have been giving quite a lot of thought to the election, a smaller majority of Latino voters (68%) say the same. However, most Hispanic voters (63%) say they are more interested in politics than they were in 2012. Among all voters, a similar percentage (60%) expresses increased interest in politics. Among both Latinos and the public overall, there are wide gaps in political engagement between voters and non-voters. But in some cases Latinos who are not registered are even less engaged than are non-voters generally. For instance, just 37% of Hispanics who are not registered to vote say they have been following election news at least fairly closely. That compares with 56% of all adults who are not registered to vote.